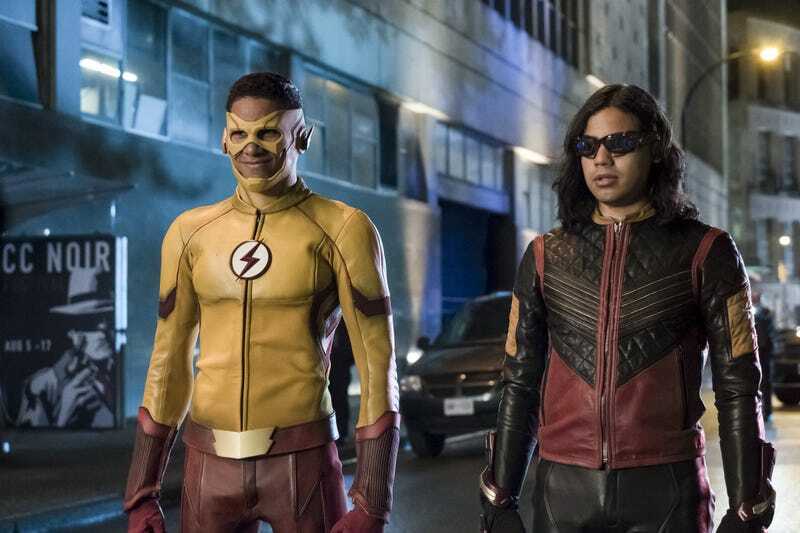 As a season premiere title, “The Flash Reborn” also serves as a promise to fans who have grown frustrated with the murky tone and repetitive plotting that has dogged The Flash for the better part of two years. In case that’s not explicit enough for some, everyone from executive producer Andrew Kreisberg to CW president Mark Pedowitz has been making it very clear in preseason interviews that the fourth season will bring back the lighter tone that served the show so well in its freshman year. It sounds like a solid plan, but we’ll have to wait and see how it plays out since this first new episode is mostly tasked with cleaning up last season’s mess. In case it’s slipped your mind, that needlessly downbeat and largely monotonous year in the life of Team Flash concluded with Barry Allen taking the place of Jay Garrick as the prisoner of the Speed Force following the defeat of Savitar. As we pick up six months later, the team has been reorganized (into either Team Vibe or Team Kid Flash, depending on whether you ask Cisco or Wally), with Iris taking on a strong leadership role. This is the first positive change of the new season, given that Candice Patton’s character spent most of last year hanging around in the background waiting to either die or be rescued. (Whether Iris has completely abandoned her journalism career at this point is a question for another day.) They seem to have things under control in Central City, defeating Peek-a-Boo as the episode begins, but when a powerful new Samurai villain arrives on the scene demanding an audience with the original Flash, a plan to rescue Barry from the Speed Force is hatched. As it turns out, Cisco has been working on said plan ever since Barry entered the Speed Force, but he needs an assist with the science. It doesn’t take him long to convince Caitlin, now working in a dive bar, to return to Team Flash. Despite her biker-chick makeover, Caitlin doesn’t appear to be irreparably damaged by her time as a super-villain (and indeed, as we learn at episode’s end, she still has some Killer Frost in her, though it’s an open question as to whether she now has more control over that side of herself). In any case, we’re given some very hand-waved exposition about the new and improved Speed Force Bazooka (now with quark sphere!) and how it will stabilize the speed dimension, allowing Barry to leave. In the end, it takes Iris putting herself in danger and needing to be rescued again to snap Barry out of his stupor. That’s not great, and neither is the villain-of-the-week, revealed to be quite literally a device that serves its purpose: Barry is reborn, free of the trauma that has made him such a mopey jerk over the past couple of seasons. Is this all too tidy and convenient? Sure, but what’s the alternative? More timeline shenanigans? The show can’t really get back on track without its center being restored to the optimistic, fun-loving superhero he once was, so I’m willing to put up with a middling season premiere that accomplishes that goal, even if it’s not the most elegant solution. Now that the reset is out of the way, it’s up to the creative team to prove they can recapture that old Flash feeling. 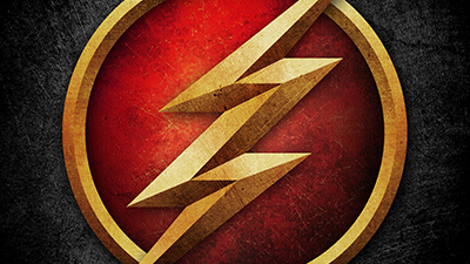 Team Flash is still down a Harrison Wells, but Tom Cavanagh’s name remains in the opening credits. The only real question is whether Harry will return to Earth-1 or an entirely new Wells will join the team. Tom Felton is no longer a series regular, however, and Julian is dismissed in a single line about his return to London. This doesn’t necessarily mean we’ll never see him again, but it was painfully obvious by the end of last season that the character just wasn’t working, especially as a full-time member of Team Flash. Samuroid is a really bad super-villain name. Too close to Hemorrhoid. Only Cisco could get away with both “Great Caesar’s Ghost!” and “Excelsior!” Talk about crossing the streams. The tag scene reveals what has been public knowledge for months now: the season’s big bad is The Thinker. Not a speedster! Rejoice!